Health Costs > How Much Does Oxygen Cost? By definition, oxygen (O2) refers to the colorless, odorless and tasteless gaseous element that we breathe without even thinking about it. In the atmosphere, it makes up for 21% of the air and is the most important gas all living things need for their survival. In its liquid state, it is light blue in color. While most people get oxygen naturally, there are some people that need a little extra oxygen because their lungs are a little weaker than normal. In this case, the person may need to pay for an oxygen tank that can supply them with the extra air that he needs. Oxygen is a free compound readily available in the air. This is good news to us! There is no bill to meet for this natural resource; however, of course, in special medical conditions, there are cases where a more elaborate system is put in place to boost the availability of this precious compound in our bodies. On average, an oxygen service that comes to your home will cost around $150 to $275 per month, without insurance. Apart from the medical usage, oxygen is also available for commercial use, such as for welding purposes. According to an article on HomeCareMag.com, the average bill for oxygen services is usually around $200 per month, with more than $145 going toward services only. Swapping or refilling a tank at a local medical supplier, instead of having a professional coming to your home, can cost around $10 to $35. Forum members on this TalkGlass.com forum thread noted that they paid anywhere from $16 to $60 per month. If you have a health insurance policy, be sure to check with your provider to see what is going to be covered. Since it is going to be medically necessary, most providers will cover it under your policy conditions. If you want a new policy or maybe you do not have one, consider browsing through hundreds for free at eHealthInsurance.com. Leasing a tank, depending on the capacity, can cost $20 to $50 per month. As stated above, it will have to be refilled. Depending on the usage, plan on refilling at least once a week. In relation to the oxygen, the tank you use can increase your electricity costs. According to the COPD Foundation, the average electric bill may increase $450 a year if you were to use your oxygen 24 hours a day, but you may be able to receive a slight discount if you call your electric company ahead of time explaining your situation. Extra tubes are recommended on hand in case the supply you have gets damaged or dirty. 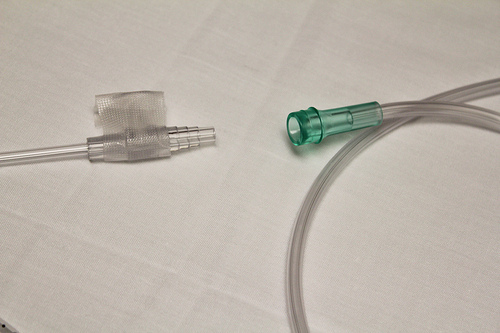 When oxygen is used at home, a small, adjustable tube will be placed under the nose, and the tube, which is attached to the tank, provides oxygen to the lungs. The average tank will weigh anywhere from 5 to 15 pounds, either wheeled on a pull cart or slung over the shoulder. In order to get an oxygen tank, a prescription will be necessary. Call around or research places on the Internet as this is a great way to get pricing. It is always a good habit to get at least three to five quotes before choosing a supplier. Medicare and Medicaid will pay approved expenses as it meets a medical necessity, and if you have a private insurance carrier, they should cover the costs, making you responsible only for your co-pay and/or deductible. If you can find someone who is able to take the empty tank to the supplier to get refilled or exchanged, you can save a lot of money over paying for the oxygen and its delivery. I pay $1.25 per pound for liquid oxygen.